A log burner not only serves a fantastic function in providing additional heating for a home, but also works as a great decorative piece that works as the focal point of the room, especially when in regular use in the colder months. To truly get the most out of these fantastic appliances, it’s a great idea to invest in some useful accessories that can help your log burner work efficiently and enhance the overall aesthetics it brings to a room. Log burners are fantastic, but the mess they can leave behind certainly isnt. Ash can be a real nuisance, especially when it’s hard to vacuum up, as it can easily clog a standard vacuum cleaner. 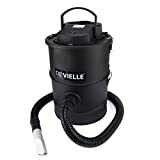 The De Vielle Ash Vacuum Cleaner has no such problem, having been specially designed to clean up the dirt and ash caused by the log burner. A three filter system will ensure all the ash is quickly removed without lowering the performance of the vacuum, making it the ideal accessory for keeping the area around your log burner clean as can be. 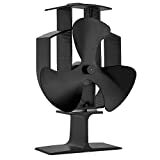 For anyone looking to increase the efficiency of their log burner, then this brilliant VonHaus stove fan is a must. Powered from the heat generated by the burner, it quietly operates to spread the warmth throughout the room, helping to get even more heat from your log burner. It’s completely eco-friendly with no batteries or electricity required – just the natural heat generated from your log burner. Read our stove fan reviews here. Log burners are beautiful appliances that add a real sense of style to any room, so it makes sense to add some accessories that enhance this further. This gorgeous grey wash wicker fireside log basket is the perfect place to store your logs that are ready for burning. It brings a very vintage and rustic style, so will work great with almost any style of log burner. Another fine log holder, expect this one offers a more contemporary style that helps to make it even more eye-catching. A great log holder can really add that bit more to a log burner setup, and this certainly does so! Made from a black metal material, it’s a robust yet stylish, with the modern slimline design that can hold a few days’ worth of logs. It is a smaller alternative to a log store. 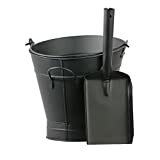 The Inglenook Waterloo Bucket and Shovel is a beautiful coal bucket and shovel pan combination that allows you to store your fuel in style. It has a very traditional coal bucket design, yet the matte black finish also adds a contemporary style to the accessory. Features two handles for easy carrying, and the overall construction is very durable, making it ideal for holding and transporting loads of fuel for the fire. This awesome cast iron baked potato cooker allows you to get even more from your burner! Not many people will have the opportunity to bake a potato of their log burner, making this a unique yet useful accessory. 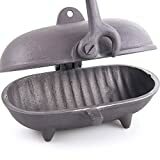 The cast iron design is very vintage, with the holder capable of cooking two medium-sized potatoes using the heat generated from the burner. Better still, you can add other foods into the cooker – just imagine freshly roasted chestnuts from your very own fire! You can never be too safe when using your log burner, which is why a good set of heat resistant gloves is a must for any owner! These gloves are made from 100% genuine leather with additional lining to ensure maximum protection from heat. Your hands, wrist and forearms will be fully protected whenever you carry logs and add them to the fire. Expect no more accidental burns when using these! Moisture meters are used to determine the level of moisture in logs and other substances, making it a fantastic piece of tech for owners of log burners. 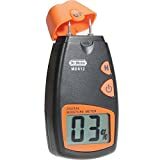 This Dr.Meter product can accurately measure the level of moisture and discover whether logs are suitable for use in the fire or if they are too damp/dry. Wood that too moist or dry will not burn as efficient as more suitable wood, meaning this accessory can help ensure you are getting maximum effected from your fuel source. A clear LCD display will let you know how suitable your logs are for burning! Log burners can often be difficult to ignite, especially when using ineffective lighters. 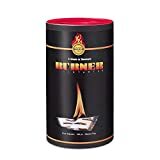 The Original Burner Firelighters are among the best firelighters on the market, so this barrel of 100 is certainly worth the investment for log burner owners. They offer odourless firelighters that can quickly and easily light the fuel on your burner. Flames are always low and controlled to ensure they remain in a confined area, and the firelighters can work even when exposed to moisture or humidity. There’s no shortage of options when it comes to wood to fuel your burner, but some are naturally better than others, including these premium heat logs that are also eco-friendly. 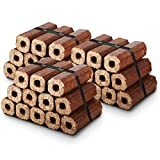 For instance, these heat logs have low moisture levels to ensure maximum efficiency when burning, while the wood has been sourced from recycled materials and sustainable forests and are compressed to create a handy log shape. Their size also remains mostly unchanged when burning, helping to avoid sparking and spitting. Smoke and ash output is also very minimal, while enjoying a steady output of heat as they burn. Check out our guides on log spltting axes and log splitters here.